Welcome to Springsteen Sundays, my weekly column celebrating my favorite musician, personal hero, and all his awesome musical friends: Bruce Springsteen and the E-Street Band! Since I stayed up far too late last Tuesday writing about Bruce and the Band’s San Jose show, I thought I’d take it easy with this week’s column and review a simple yet exciting new Springsteen release. HD image - Click to enlarge! For pure collector’s value, the single is certainly a nice package. I love the cover art, which is in line with the gorgeous black-and-white, gritty photography found in the Wrecking Ball LP, and the back cover, though stark and simple, is also fairly striking. The labels on the vinyl itself mimic the white-paint design of the LP labels, and the middle circle of the single is filled in so you won’t need an adapter. If you just like collecting Springsteen singles, regardless of the music itself, “Rocky Ground” is certainly a nice one to have. But the songs are, of course, very good. The highly spiritual “Rocky Ground” has grown on me more and more in the weeks since the album’s release, and has in fact become my favorite new composition from the record. I wrote an in-depth analysis of the song when it first came out, which is worth reading if you’d like to learn more about the song itself. It’s presented on this single exactly as it was on the album, so in that regard, you’re not getting anything new (especially if, like me, you splurged for the complete Wrecking Ball LP). It’s certainly nice to have quick, easy access to the track on vinyl, but then again, “Rocky Ground” isn’t a song I usually listen to on its own. It’s so ingrained into the fabric of Wrecking Ball that listening to it out of context lessens the song’s power, and I think there are other tracks on the album that could serve as better singles. I personally would have gone with “Shackled and Drawn,” which I can never get enough of, or “Death to My Hometown,” both of which sound far more like ‘singles’ to my ears. 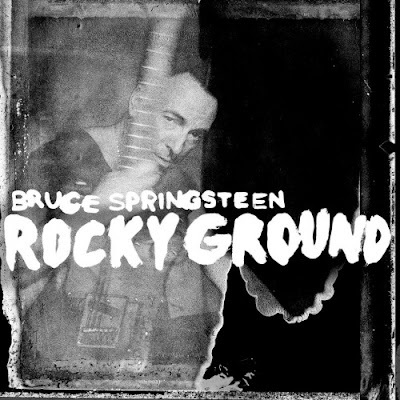 I wouldn’t say the single is worth a purchase for “Rocky Ground” alone (unless you don’t have Wrecking Ball on vinyl), but I suspect most Springsteen aficionados are going to go nuts for the B-side. As I explained in a recent Springsteen Sundays column, “The Promise” may be Bruce’s best song, and you should read that article if you’d like to learn more about it. There have been many different interpretations of the song over the years, and this live cut is absolutely one of the best. It’s similar in arrangement to the E-Street Band cut from the titular 2010 Promise album, but up-tempo with a bit more energy and texture. It sounds fantastic; the Band is in top form, Springsteen’s vocals are sublime, and the arrangement maintains the devastatingly sad core of the song without reveling in misery, as some of the other recordings have done. I think this is the kind of cut Bruce was looking for when he spent months tinkering with the song in the studio for the Darkness album, and I could easily hear this interpretation slotted between, say, “Streets of Fire” and “Prove it All Night.” The track sounds rich and full-bodied on vinyl, and though the performance was included on the standalone DVD release of “The Promise” documentary, this will be completely new for the many fans who bought the six-disc Darkness reissue. 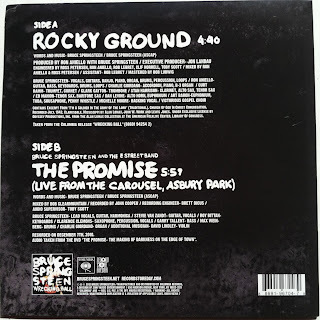 So while I can’t recommend the single for “Rocky Ground” alone, “The Promise” is definitely worth the money. Throw in the inherent collector’s value of the single, and this is a release many die-hard fans should be eager to get their hands on. Though Record Store Day has passed, you can probably still find leftover copies at your local record shop, and it’s available from several online retailers as well (including the Springsteen fansite Backstreets.com). The price has inflated since last weekend, so weigh your need carefully, but if you love “The Promise” and enjoy collecting singles, it’s certainly worth a look. If you picked up the single, what do you think of it? 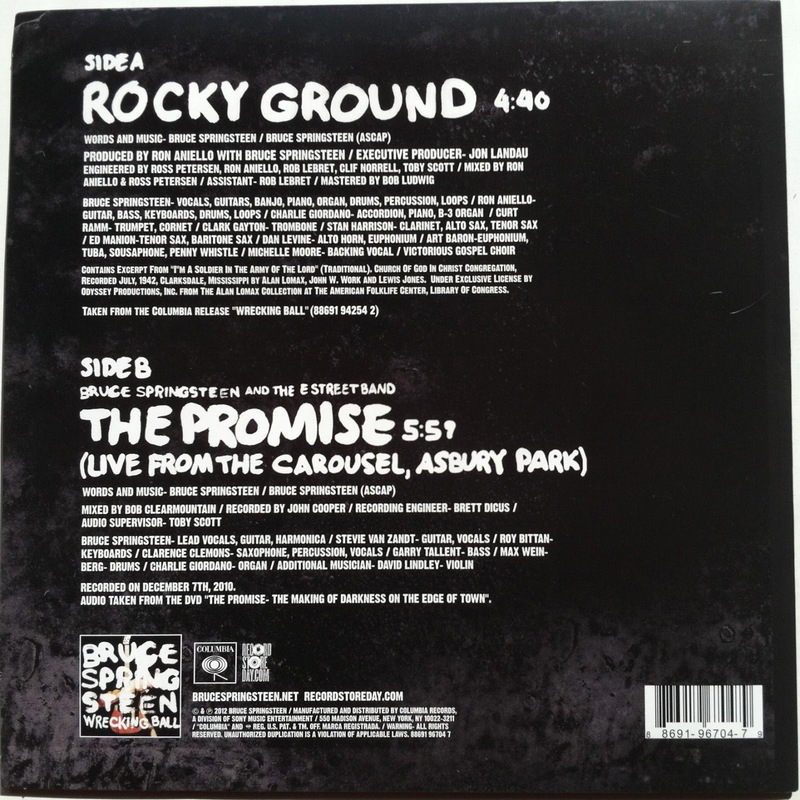 Do you like having "Rocky Ground" on the A-Side, or would a rarity, a la "The Promise," be more appreciated? Was there a better song from Wrecking Ball for this release? What would you like to see for next year's Record Store Day single? Sound off in the comments!